Everyone wants to be a hedge-fund manager these days, it seems. Or at least they want to invest like one. Now, individual investors have more opportunities to get in on the action. Hedge funds, private partnerships that bet both on and against various investments, manage more money than ever, and interest in them remains strong. Over the past 15 years, their returns have beaten the overall stock market, helping drive the boom. Hedge funds also navigated the 2008 downturn with smaller losses than stock mutual funds, and tend to attract the best and brightest from Wall Street, largely because they pay top salaries. The love affair has endured even though hedge funds have underperformed the broader market since 2009, when stocks began rallying. From then through June of this year, the average hedge fund is up 50%, according to HFR Inc. The S&P 500 climbed 137%, including dividends, over that time. Stocks today are expensive, and hedge funds’ ability to buy stocks, bonds and commodities, as well as bet against overpriced investments, is valued in challenging markets. If the Federal Reserve begins raising interest rates next year and the market runs into problems, hedge funds might be best positioned to take advantage. The problem is, only “accredited” investors are legally allowed to invest with hedge funds because of the perceived risks. And even if an investor vaults over this threshold—defined as an individual whose annual income tops $200,000 or whose net worth exceeds $1 million, excluding a primary residence—hedge funds generally charge hefty fees of about 20% of any gains and about 2% of assets annually. In recent years, however, more options have emerged that allow even small investors to engage in hedge-fund-style investing without big fees. Here is a look at the advantages and risks of three of these approaches. The closest most small investors can get to hedge-fund-like investing is through “alternative” mutual funds. As with hedge funds, most of the money in these newer mutual funds is in portfolios that use a long/short investing strategy: They can both bet on individual stocks going up (in industry parlance, “going long”) and profit from others going down (“shorting”). The largest such fund, MainStay Marketfield, has assets of about $20 billion and has been around since 2007. One advantage long/short mutual funds have over hedge funds is transparency. While most sizable hedge funds disclose their stockholdings on a quarterly basis, they don’t share information about their short positions and debt holdings. By contrast, long/short mutual funds must provide a public list of quarterly positioning, along with other data. As such, investors can track a manager’s views, and decide whether they agree with them. Long/short mutual funds also can be bought and sold on a daily basis, unlike a hedge fund. Although these mutual funds don’t charge performance fees like hedge funds do, they collect hefty annual management fees that in some cases approach 4% of assets. This acts as a hurdle to jump over every year, and it creates an incentive for managers to amass ever larger piles of money to invest, which can hurt performance. The average actively managed mutual fund, by comparison, charges a 1.2% annual expense fee, according to Morningstar. Lori Van Dusen, who helps clients invest billions at LVW Advisors in Pittsford, N.Y., says this year she began recommending that clients consider long/short stock mutual funds for the first time since the financial crisis. “We are long in the tooth in the profit cycle, and equities do not remain the bargain they were a few years ago,” she says. Among the funds she recommends are some run by Boston Partners, a division of Robeco Investment Management Inc.
Another fast-growing area is so new proponents can’t agree on a name. Sometimes called “replication” funds and other times “liquid beta,” these vehicles try to imitate the performance of hedge-fund benchmarks, much like an exchanged-traded fund tries to produce the results of an underlying index. ETFs, however, know the components of the indexes they try to copy. Because hedge funds keep some of their positions secret, beta funds take a different tack: They “backtest” their portfolios of stocks, bonds, currencies and other assets—meaning they do a simulation of a trading strategy on prior time periods—until they approximately copy the trailing returns of the average hedge fund as tracked by research firms like HFR. “This works surprisingly well,” says Andrew Beer, chief executive officer of New York-based Beachhead Capital Management LLC, whose firm runs one such strategy for wealthy investors. Mr. Beer says that even though his fund may not be able to exactly duplicate what the biggest hedge funds are doing, Beachhead is able to match their returns because of lower fees. One problem for such funds: Most successful wealthy investors look for hedge funds that beat their peers, not match them. And if hedge funds continue to do worse than the overall stock market, investors betting on the broad hedge-fund sector could have regrets. One big player, IndexIQ, celebrated its five-year track record this year for its replicator fund, IQ Hedge Multi-Strategy Tracker QAI -0.40% ETF. The fund has an average annualized return of more than 4% over that time. Other funds in the space includeCredit Suisse Multialternative Strategy fund and ASG Global Alternatives fund. 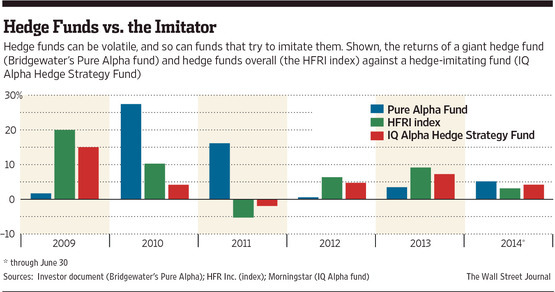 Another low-cost way to trade like a hedge-fund manager is to ape the best-performing funds. Even top hedge funds employ this technique, keeping a close eye on each other’s holdings. The approach is fraught with risk, however. Hedge funds with portfolios of more than $100 million of public securities must file 13F forms with the SEC in which they list a snapshot of their largest stockholdings. (They don’t have to disclose other positions.) The forms must be filed within 45 days of the close of each quarter, and investors can search these filings on the SEC’s website. One tip: Look for new and increased positions of top hedge-fund firms to get a sense of the companies the funds are bullish about, along with decreased and “sold out” positions for those the firms seem more pessimistic about. Among the hedge-fund firms with stellar long-term performances worth keeping an eye on: Appaloosa Management LP, Lone Pine Capital and Greenlight Capital Inc.
Services such as FactSet‘s FDS +0.71% LionShares, InsiderMonkey.com and whalewisdom.com will analyze these filings for investors. Individuals also can hop a ride on disclosures from successful activist hedge-fund investors—who publicly prod companies to take steps to boost their stock prices—through a vehicle such as 13D Activist Fund. The fund combs through the 13D filings of activist investors and bets on companies where it believes activist campaigns have the best chance of succeeding. The problem with copycat investing is that the information can be quite stale by the time it’s released; 45 days can be an eternity in the hedge-fund world. Also, funds may own shares simply as a hedge against a stock in the same sector, or as part of other moves that don’t necessarily reflect how a manager feels about a company. But that comes with the territory if you want to invest like a hedge fund.